Please see below for the 2015 All About Food: From Farm to Fork conference registration announcement. Hope you have safe and joyful holidays! 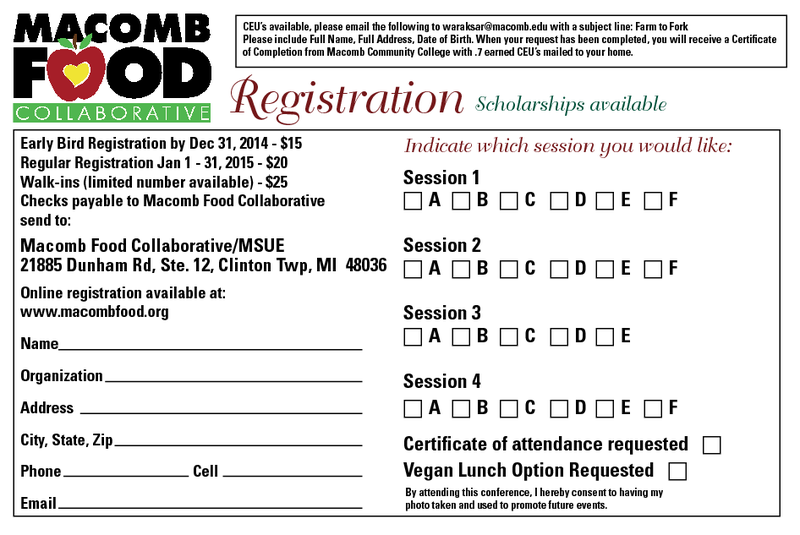 The Macomb Food Collaborative is thrilled to announce that registration for the 2015 All About Food: From Farm to Fork Conference is now open! Online registration and payment available. Please note that online registration includes credit card processing fees. Keynote address is by Dan Carmody, President, Eastern Market Corporation. A wide variety of workshops are available to choose from. 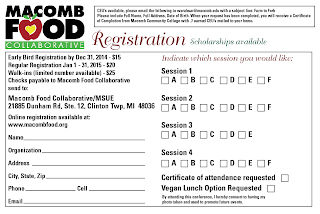 Everything from Community Food Systems, Food Hubs, MAEAP, GE/GMO, Gardening, Composting to Food Allergens, Food Preservation, Goats, School Gardens, Michigan Wine Industry and more! Please distribute widely amongst your networks.